From now up to the 18th of December, the Vasari Corridor is once again open for visits but only with reservations. These visits, guided by special staff from the Supervisory board, are only offered for short periods of time during the year for small groups but at a reasonable price (14 euro which includes entrance into the Uffizi, which you can visit beforehand). The famous corridor, built in 1565 by Giorgio Vasari to celebrate the wedding between Francesco I de’ Medici to Joan of Austria, connects Palazzo Vecchio to the Uffizi Gallery and to the Palazzo Pitti. It was a special passageway reserved exclusively for use by the Medici so that they could move freely from their residence at the Palazzo Pitti to Palazzo Vecchio, the seat of government. The Corridor today, as it did then, continues to exhibit artistic masterpieces along its walls but the main collection is that of the self portraits – commissioned at first but after a while the collection starting growing through donations from painters across the globe. The route starts in the Uffizi Gallery and ends at the side of the Buontalenti Grotto in the Boboli Gardens. Last winter we took part in one of these guided visits and it was an extremely interesting experience. The guide was able to transmit the history of the Corridor in an involving manner, often stopping to tell of particular anecdotes and providing background details. 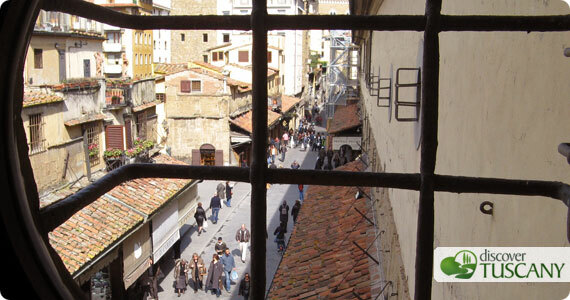 As you walk through the corridor you also get a chance to see some of Florence’s best views from the small windows, from above the “heads” of Florentines (just as the Medici used to do) and tourists alike and the sensation is truly particular! The views are unique as not many get to see the Ponte Vecchio or the Uffizi from above. It is also interesting to place your location inside to what lies below, getting to know the route of the Corridor much better. The visits are only in Italian for groups of up to 20 people but we truly recommend them nonetheless. It is necessary to reserve by telephone at Firenze Musei at: 055.2654321 . – Thursdays and Fridays at 9.00 am, 11.30 am and 2.00 pm.